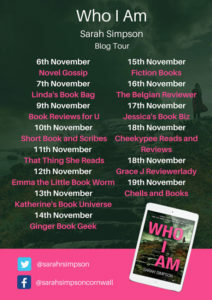 Welcome to my stop on the blog tour for Who I Am by Sarah Simpson. You can read my review further down this post and I’d like to thank Sarah and Vicky Joss from Aria for asking me to be a part of the tour. 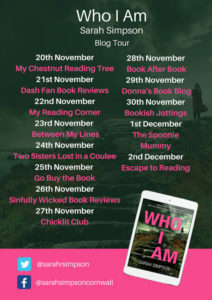 Who I Am is the twisted story of Andi and Camilla. They met at university but were from different sides of the tracks. Andi came from a moneyed family, with a huge house in Oxfordshire and a holiday home in Cornwall. Camilla’s parents were alcoholics and had no money at all. From the beginning we know that one of them is playing a game, trying to be something they are not. As the book progresses, it jumps around in time between those university years and the current day, and tells the story from different viewpoints. Andi now lives in Cornwall but she’s troubled by something from the past. It’s not until almost at the end of the story that we learn what it is. First of all, I’d like to say that the author’s familiarity with Cornwall really comes through and it wasn’t hard to imagine the setting there. But part of the book is also set in Edinburgh and again, I could put myself there. There’s a fairly strong sense of place in this book and Simpson does a great job at evoking that. The dynamic between Andi and Camilla is fascinating, but there are also others in their group of friends and they play their own, more minor, part in the story. It’s actually quite hard, knowing what I now know from the end of the book, to write much about the story itself. Suffice to say, there is an amazing twist coming your way if you read this book. I did find it a bit confusing to keep up with at times. I think the author was trying to make it very twisty and certainly succeeded with that, but it also made it a bit tricky to follow (for me, at least), especially when you add in the different time periods as well. I do love a book that challenges me in this way, but I must admit it took a bit of concentration. Having said that, I can see that Sarah Simpson is good at plotting and bringing all the threads together and I honestly never saw what was coming at the end. Andi’s current day story, in particular, was the most interesting for me and I was eager to find out what it was that she was hiding. 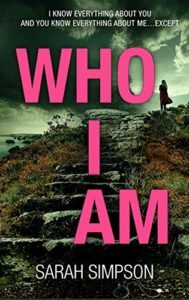 This is most definitely a psychological thriller as it’s all about the characters playing mind games with others and manipulating them. If you like this genre then you’ll enjoy this book as long as you make sure you pay attention!